Got hard boiled eggs that you dyed for Easter? A great way to enjoy them after the hunt is to make them into stuffed eggs. I have tried all kinds of recipes for stuffed (or “deviled”) eggs over the years, and this one, using lemon, tarragon and mustard, is our favorite. The stuffing is quick to prepare, so we usually have these eggs for lunch on Easter Sunday. Tarragon has a fresh, anise-like flavor that goes very well with lemon. I grow tarragon as a perennial in the front flower bed, where it requires no care, and is not bothered by any pests. There is not enough of the herb poking out of the ground yet at this time of year though, so I bought some tarragon for making these spring eggs. One thing to keep in mind for stuffed eggs, or any other recipe using hard boiled eggs, is that older eggs are easier to peel than fresh eggs. You want a nice smooth egg that comes cleanly out of the shell, so it is best to buy your eggs a week or so ahead of boiling them, particularly if you are buying fresh from a farm. I forgot to buy the eggs ahead of time this year, but had no problem—perhaps the supermarket eggs that I used had been in the store for a few days. To prepare hard-cooked eggs that have a nice yellow yolk, with no green at the edge, I cook them by the following method: Put the eggs in a pan of cool water, with the water covering the eggs by an inch or so. Bring to a full boil over high heat. Then reduce the heat to a lower boil for 10 minutes. Remove the pan from the heat and pour out the hot water, then refill with cold water to cool the eggs. Continue running cold water over the eggs until they are no longer hot. Put the eggs in a bowl in the refrigerator until ready to use. Quickly cooling the eggs after cooking keeps the yolks a nice bright yellow. When ready to peel the eggs, crack the shell all over, rolling the eggs around on a hard surface. This seems to help with clean removal of the eggshell. I like to use medium, instead of large, eggs for stuffed eggs, because they are easier to pick up and eat. But you can use any size egg that you like. Out of the dozen eggs that I boiled, 2 cracked, leaving me with 10 eggs good-looking enough to stuff. I used five of them for this recipe, and will use the other five to make curried stuffed eggs tomorrow! 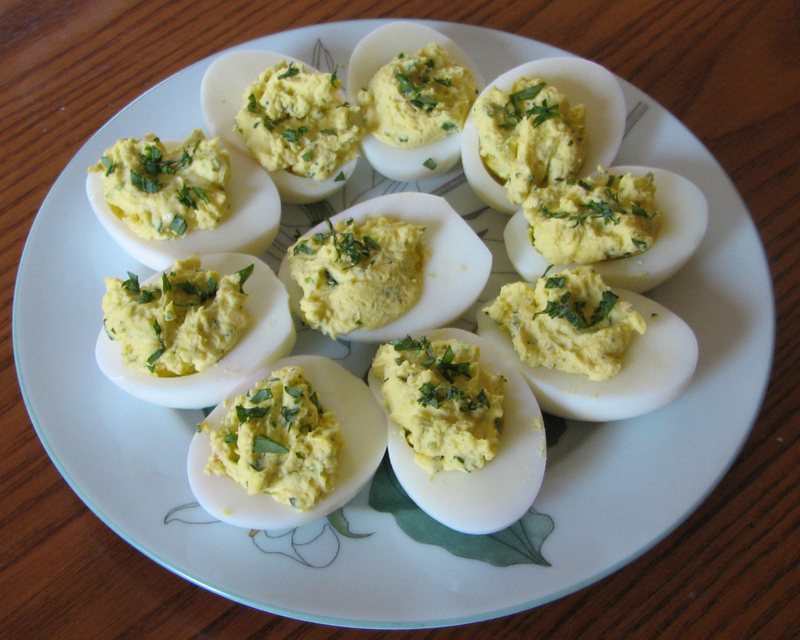 The recipe for Lemon Tarragon Stuffed Eggs comes from the April 1995 issue of Gourmet. Because I used fewer eggs, I reduced the amount of mayonnaise and shallot, but I kept the original amount of mustard, lemon and tarragon. Slice the eggs in half lengthwise. Remove the yolks and mash them with a fork in a small bowl. Add the remaining ingredients to the yolks, and salt and pepper to taste. Mix well with the fork. If the yolk mixture seems too dry, add a little more mayonnaise or lemon juice until it is a consistency that you like. Using two spoons, gently place a spoonful of the mixture to each hard-cooked egg half. Sprinkle each stuffed egg with a bit of minced tarragon leaves. These eggs can be made ahead of time and kept covered in the refrigerator until ready to serve. This entry was posted in Holidays, Recipes and tagged deviled eggs, hard-cooked eggs, lemon, recipes, stuffed eggs, tarragon. Bookmark the permalink. I love the idea of adding lemon zest and tarragon, my new favorite spice. Great tips too on the prep.